I am Armin Nagel, a comedy speaker, moderator and service expert with successful performances for more than thirty years. Furiously entertaining and with unconventional means, I convey to domestic and international businesses what customers really want and show them practical, playful ways to improve their service culture. The German TV station ZDF has called me ‘Germany’s first service comedian’. As a Key Note Speaker I create a creative atmosphere that makes people see things from a fresh angle. My basic principle is ‘learn and laugh’, and my inspiring, unconventional style thrills not only global players, but also small and mid-sized businesses. I am also on tour as a TV expert (e.g. for SAT 1, Weck Up and ZDF Reporter). With my web video format ‘Der Servicepionier’ (The Service Pioneer), I feature new service ideas in my lone battle against the service wasteland. Upon request, I will develop and produce custom-made, on-target service video clips for your event and include it as highlight in my presentation – like the customized ‘carglass customer journey’ video, I had produced for a management conference of the company Carglass. I am one of the few speakers who will guide your audience through the event and will also perform in the evening programme, guaranteeing intelligent entertainment and roaring laughter. I will contribute not only to the professional, but also to the emotional success of your event. Service can be fun, too! Businesses that know what their customers want are one step ahead of their competitors. 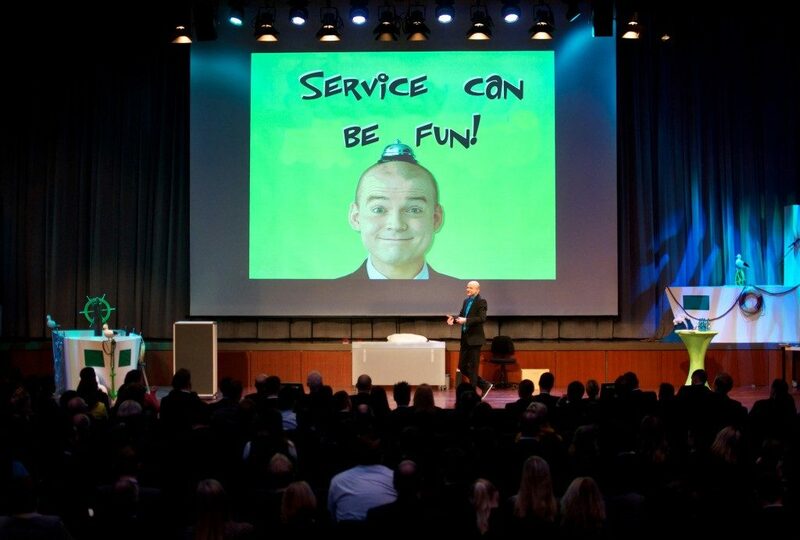 With the help of the customer-benefit-perspective and various practical examples, “Germany’s funniest service expert” (ZDF) provides valuable impulses for a better service culture. I am not only a speaker, but first and foremost a man of action! In my keynote speech ‘Service can be fun!’, I set an example by showing innovative and unconventional service sketches in his self-produced video clips. Why do customers only get good service when they do not want it? Don’t worry, the customer only wants to play! As special you will see your custom-made, on-target service video clip as the highlight of the talk, and a DVD for your guests to take home! Power Play – Business Comedy at its best! The business comedy show that addresses the modern worlds of work – ideal as evening entertainment programme of conferences, workshops or corporate events. In a combination of stand-up comedy, visual / artistic comedy and interactive features, I will furiously entertain your audience in an evening entertainment programme. I received part of my training at the British national Circus Theatre School in Bristol. As a business comedian who looks back on more than 1.000 live performances, I am bound to contribute not only to the professional, but also to the emotional success of your event. Interactive, sensitive and always with a punch-line up his sleeve, my stage show will take up the questions and contents of your event from an entirely new angle. I push the limits of the modern world of work! With my humour and my open, charming manner, I invariably succeed in creating a respectful atmosphere in which everyone feels at ease. By laughing together, people will more readily break the ice and engage in conversation.